TASC Practice Tests are an ideal way to prepare for your upcoming TASC exam. The DRC|CTB developed and administers the TASC test to help certify that students have the knowledge and skills equivalent to graduating high school seniors. The TASC test covers five subject areas: math, reading, writing, social studies and science. 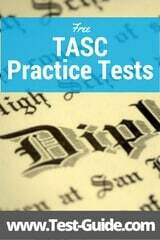 Our directory of free TASC practice tests are listed below. Taking sample questions is an effective way to study for your high school equivalency exams. Our free TASC sample tests provide you with an opportunity to assess how well you are prepared for the actual TASC test, and then concentrate on the areas you need work on. Test-Guide.com's sample TASC questions are an excellent way to study for your upcoming TASC exams. Our sample tests require no registration (or payment!). The questions are categorized based on the TASC test outline and are immediately scored at the end of the quiz. Once you are finished with the quiz, you will be presented with a score report which includes a complete rationale (explanation) for every question you got wrong. We will be adding more sample test questions in the near future, so please come back often. If you like these TASC practice questions, please make sure to like us on facebook! Increasing Your Speed - All of the TASC exams are timed. Although most students who take the TASC feel that there is sufficient time, taking the practice tests with self-imposed timers help you budget your time effectively. Understanding the Test Format - Every standardized test has its own unique format...and the TASC exam is no different. As you take practice tests you will become comfortable with the format of the actual TASC test. Once the test day arrives you will have no surprises! Focus Your Study - As you take more and more sample tests you begin to get a feel for the topics that you know well and the areas that you are weak on. Many students waste a lot of valuable study time by reviewing material that they are good at (often because it is easier or makes them feel better). The most effective way to study is to concentrate on the areas that you need help on. Subjects covered: The TASC math exam covers the following areas: algebra, functions, geometry, number operations, quantity, and statistics/probability. Overview: The TASC math test includes word problems using real-world situations. Students are presented problems that includes diagrams, charts, graphs, and tables. Calculators are allowed in the first part of the exam but not for the second section. Subjects covered: The TASC reading exam covers the following areas: comprehension, analysis, application, and synthesis. Overview: The TASC reading exam tests the student's ability to understand information presented in reading passages. The reading passages may include excerpts from: novels, short stories, newspapers, magazines, poetry, drama, and business documents. Questions may include multiple-choice, constructed-response, or technology-enhanced questions. Subjects covered: The TASC writing exam covers the following areas: organization, sentence structure, usage, mechanics, and contexts. Overview: The TASC writing exam measures how well a student can identify and correct errors in written text. Errors will include sentence structure, usage, mechanics, and organization. Similar to the reading exam, the question types include multiple choice, constructed response and technology-enabled. Students are also required to write an essay. Subjects covered: The TASC social studies exam covers the following areas: U.S. History, World History, Civics and Government, Economics, and Geography. Overview: The TASC social studies exam assesses a student's understanding of the basic principles of history, economics, geography, civics, and government. Students are presented with written passages, graphs, illustrations, and charts. Subjects covered: The TASC science test covers the following areas: Earth and space sciences, physical sciences, and life sciences. Overview: The TASC science test requires students to recall and apply knowledge and skills, and reason with scientific information. Questions will present graphs, maps, tables, figures, and charts. Each of the five TASC subject tests are score independently. Students must score at least 500 to pass a subject test. Additionally, a student must get at least a 2 out of 8 on the writing prompt. A student passes the overall TASC exam when they receive a passing score on each of the 5 subject tests. If a student does not pass a specific subject area, they are allowed to only retest that subject. Scores are available within 24 hours after taking a computer based test. For paper and pencil test takers, the scores may take as long as 10 business days to be reported.